The following guest post by Lauren Finzer, Regional Partnership Manager of Revolution Foods, discusses how a small grant from PVF made a big impact in feeding healthy breakfasts to students. 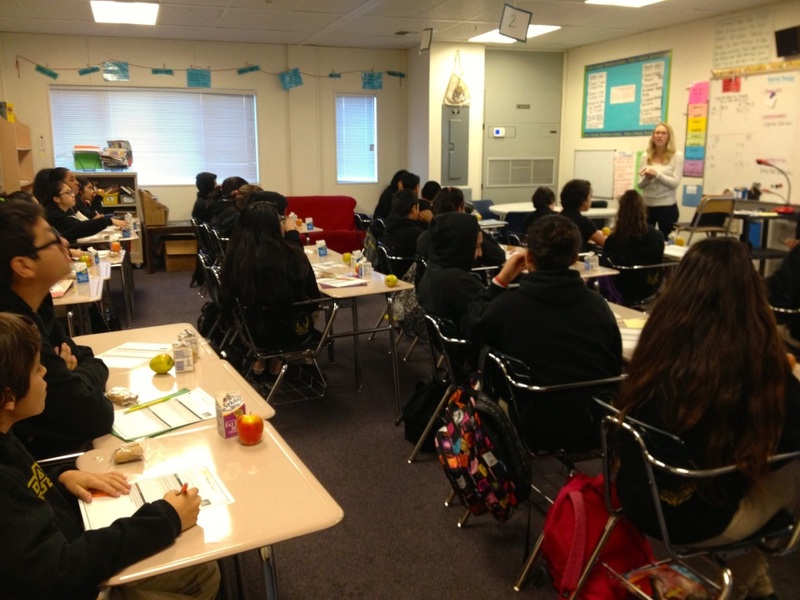 Middle schoolers are rarely quiet, but the first few minutes of Ashley Baker’s class at Aspire East Palo Alto Phoenix Academy (EPAPA) are the quietest all day. Her seventh graders are busy munching on whole-grain bars as they concentrate on the first task of the day: watching and analyzing a recent news clip. Before last spring, few of Baker’s students had a healthy breakfast every morning. Many skipped breakfast entirely. Others started the day with only “junk food” such as a sugary Starbucks drink or at best a packet of Cheetos. Baker and other teachers would use their own scarce funds to buy snacks from Costco or Safeway to keep in the classroom for students who felt nauseous or lightheaded from hunger. 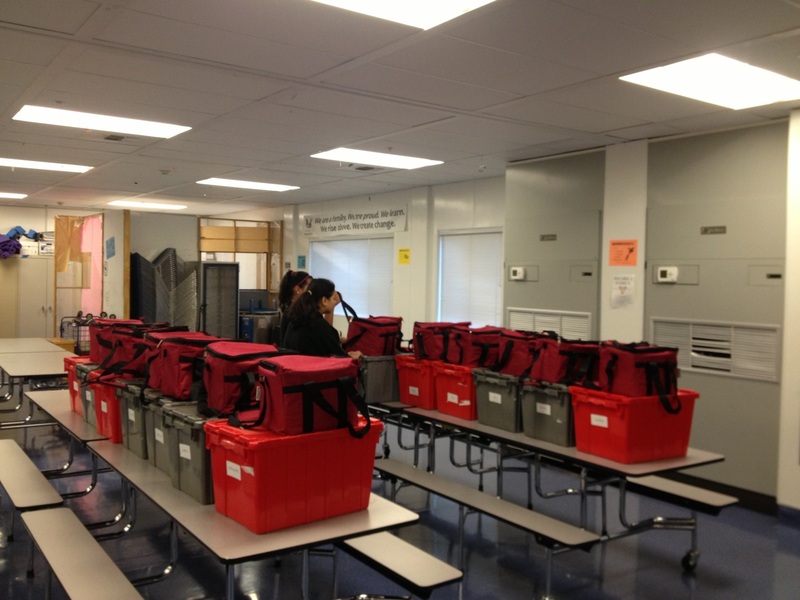 Student helpers pick up breakfasts for their class from the cafeteria every morning. Last spring, Baker got frustrated and became determined to find a lasting solution, especially during high-stakes testing periods. She learned that nationwide, a best practice for ensuring that students start the day well-nourished and ready to learn is to serve them a healthy breakfast in the first few minutes of class. Her fellow teachers liked the idea, and together they voted to pilot the program with healthy breakfasts from Oakland-based Revolution Foods. Philanthropic Ventures Foundation made the May pilot possible by funding insulated bags for student helpers to carry milk and breakfast items to class. Student helpers fetch breakfasts from the cafeteria and distribute a full breakfast on every desk before first period every day. Students in Ms. Baker’s class listen attentively as she describes the first lesson, during which the students will eat their breakfasts. The pilot was so successful that teachers voted to continue. Since the program’s start, they have served over 36,000 nutritious breakfasts to their students – sharply reducing the sugary Starbucks drinks and Cheetos around campus in the morning. The meals served to the students meet incredibly high quality standards, including being free of any artificial colors, flavors, or preservatives. Options include Kashi cereal, whole-grain bagels with Organic Valley Cream cheese, hardboiled eggs, and a variety of whole grain muffins and bars, all served with fresh fruit and rBST-free milk. Teachers and students alike love the program. Baker and her colleagues report that their Breakfast in the Classroom program has improved student behavior and memory, and supported all-around healthier food choices for their students throughout the day. This is consistent with reports from other Breakfast in the Classroom programs around the country. One of the best things about the program is that, after that initial investment by PVF, it is financially self-sustaining: Serving free, high-quality breakfasts to all students every day doesn’t cost the school a cent. The high percentage of EPAPA students that qualify for school meals to be reimbursed by the government means that the new program actually brings in revenue to support the school meal program in serving healthy Revolution Foods meals for lunch as well. In Baker’s class today, students are much less likely to swing by McDonalds or Starbucks on the way to class than they were last year. Instead, every EPAPA student sits down to a whole-grain cinnamon oat bar, crunchy Gala apple, and rBST-free milk. At the end of the first period, students dispose of any waste as they file out of class. Fortified by a nutritious breakfast, they are ready to concentrate and absorb the next three hours of instruction without any pangs of hunger distracting them from their learning. All photos courtesy of PVF grantees unless otherwise noted.